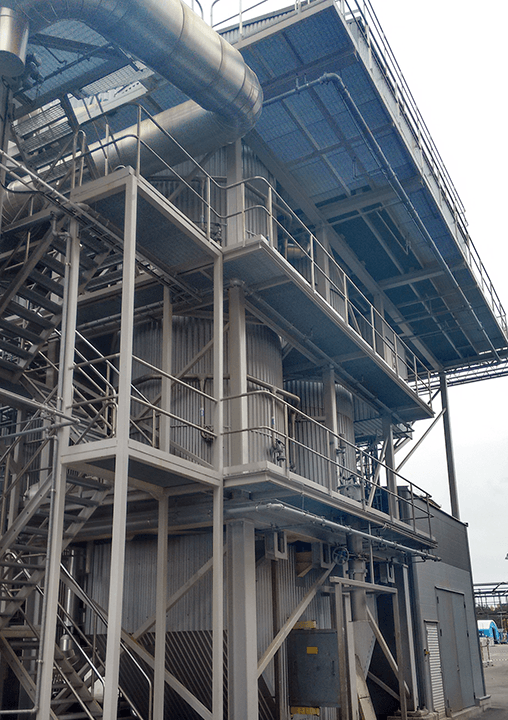 West Biofuels uses a modular approach to biomass management to meet the needs of the customer. Weather the goal is power generation, heat production, combined heat and power, liquid fuel production, biochar production or any other product, West Biofuels can configure an optimal system to meet the goals of the customer. 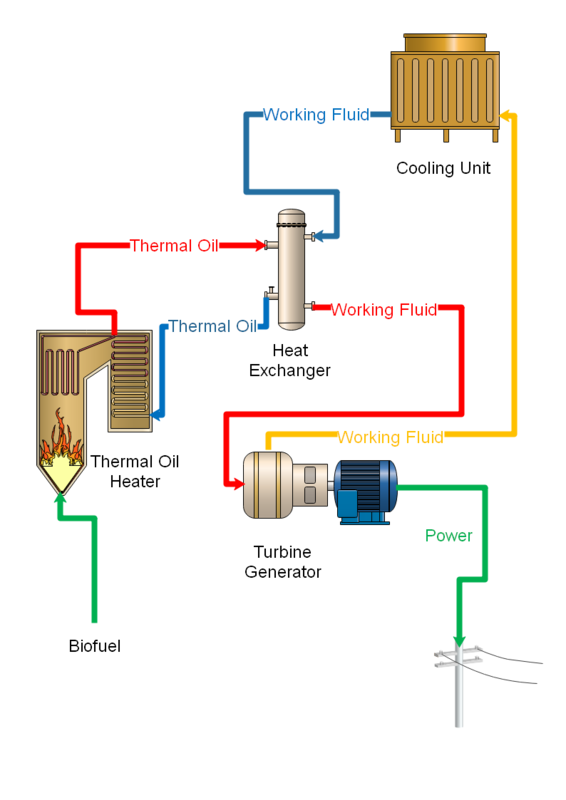 The West Biofuels thermal oil heating system converts the gases from the gasification process into usable heat energy via a thermal fluid. The thermal fluid is specifically engineered to fit each application. This heated thermal fluid is then used for building/process heating, or to generate power using the organic Rankine (ORC) cycle turbine generator. TOH is ether coupled to an external gasification system or uses the biomass directly (or both) to meet customer demands. Because the TOH is a closed loop there is no demand for cooling water, boiler feed water, and there is no water conditioning equipment needed. The TOH uses multiple sections to obtain an extremely high efficiency, and the best utilization of the available energy in the biomass. The multi-zone approach used in the TOH along with exhaust gas re-circulation eliminates problems of slagging and ash melting/fouling common in other biomass energy systems. The TOH multiple emissions control technologies to exceed the strictest requirements. These emissions technologies include exhaust gas re-circulation (EGR),electrostatic precipitation (ESP) and urea injection. West Biofuels electrical power generation projects use organic Rankine (ORC) cycle turbine generators. The ORC turbine is similar to the steam turbines used in conventional power plants but use a closed loop organic fluid instead of steam. This results in reduced maintenance and operating costs and eliminates the water consumption issues associated with conventional steam turbines. Additionally,the ORC does not require any of the special permits/certifications associated with high pressure steam boilers required for steam turbines. The Rankine Cycle is a thermodynamic cycle that converts heat into work. The heat is supplied to a closed loop, which typically uses water as working fluid. The Rankine Cycle based on steam provides approximately 85% of worldwide electricity production. The Organic Rankine Cycle's principle is based on a turbo generator working as a conventional steam turbine to transform thermal energy into mechanical energy and finally into electric energy through an electrical generator. Instead of generating steam from water, the ORC system vaporizes an organic fluid, characterized by a molecular mass higher than that of water, which leads to a slower rotation of the turbine, lower pressures and no erosion of the metal parts and blades. The ORC turbo generator uses medium-to-high-temperature thermal oil to preheat and vaporize a suitable organic working fluid in the Heat Exchanger. The organic fluid vapor rotates the turbine , which is directly coupled to the electric generator, resulting in clean,reliable electric power. The exhaust vapor flows through the Cooling unit, where it is then condensed. The organic working fluid is then pumped into the Heat Exchanger, thus completing the closed-cycle operation.